Fragmentary Evidence » Public Works…Works! « Safer Streets By Any Means Necessary? 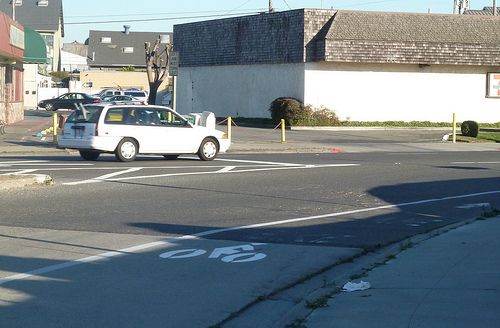 This entry was posted on Thursday, September 22nd, 2011 at 4:33 pm	and is filed under Automobiles, Bicycling, Oakland. You can follow any responses to this entry through the RSS 2.0 feed. You can skip to the end and leave a response. Pinging is currently not allowed. I hope the new paint makes a difference. Thanks, I totally agree. The new paint is at best a band aid for an area which has larger problems for cyclists and pedestrians, for all the reasons you cite. I’m sure cars and trucks will still encroach in the bike lane, but I am hoping that the fresh paint will reduce the likelihood of a cyclist injury by some non-negligible amount. I’m curious about your reference to being assaulted in Oakland. I’m very sorry to hear that! Were you assaulted while riding your bike? If you care to share the story, I’m eager to hear it. 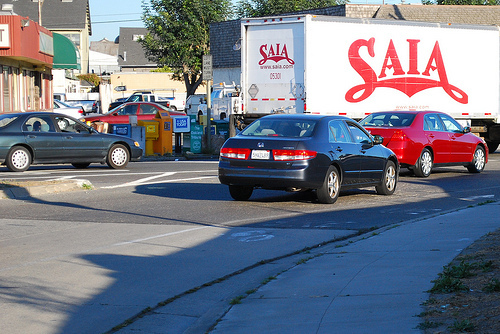 I’ve been fortunate to live, walk and bike in Oakland for a decade without serious incident (oblivious and/or indifferent drivers, and the occasional hostile honk or heckle, are the worst I’ve experienced…knock on wood). I was sad to read about the death over the weekend of an Alamedan cyclist who reportedly lost control while descending a relatively steep and windy stretch of Grizzly Peak Blvd, and got hit by an oncoming car. Some people who used to drive that area before the bike lane remember that street as a two-lane road for vehicles. It is similarly important for bicyclists to be aware that drivers form their driving habits. If drivers “remember” a road as being two lanes for cars, their driving instinct may overcome the newer roadway designation. Some drivers only drive on that roadway a couple of times a year. It takes a while before “everyone” should notice the change in roadway designation. Only after about five years of a “change of roadway designation” would I feel that the roadway is then fully up to its new designation where the older drivers should have now noticed the new designation and changed their driving habits accordingly. I thought you had given up on this site.Nice to see a post again.Are you still using Facebook? I hadn’t given up, just got out of the habit of posting. We’ll see if it takes another 4 months to produce the next post. Why not cross-post your google plus posts here? hey glad to see you are posting again, your blend of city planning geekery and aesthetic discourse often hits the spot for me.